Based on our research, we’ve come up with a standard audience setting for NPS Surveys that will allow you to receive feedback on your users throughout their journey with your product. By default, your NPS Survey will show to 5% of all of your current active users on a given day on all domains that have Appcues installed and on any URL path of those domains. Your survey will also show once every 60 days after they have visited at least 5 pages of your site, OR after 7 days from when they click on “Ask Me Later”. These settings can be changed to match a frequency cycle and audience segment that makes sense to your product. Ideally, you’ll want to sample the most general audience on a rolling basis and responses should be spread out within each survey cycle. Pages are defined by their URL path. You can include or exclude URL paths with this setting. "All pages, except certain ones" will exclude any pages that end with specified URL strings. "Only certain pages" will include any pages that end with specified URL strings, and exclude all others. For any other type of targeting, you can use "Advanced page targeting", which is identical to the page targeting for Appcues Flows. 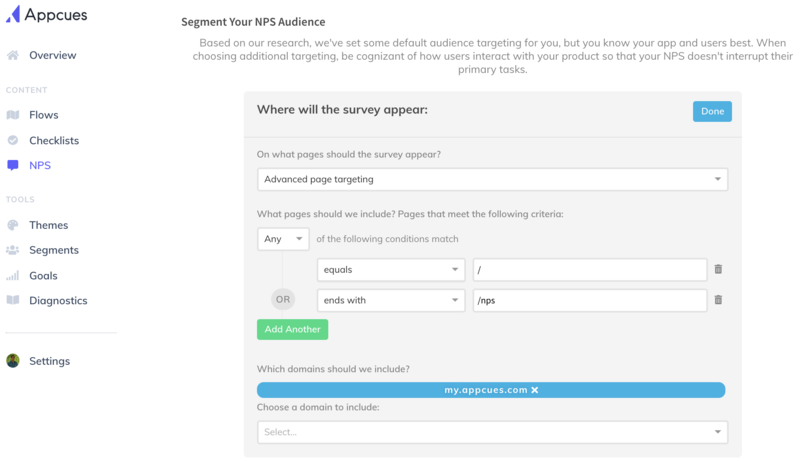 After you install Appcues, you'll be able to set your NPS survey to specific domains. Alternatively, you can define the domains for targeting by adding them on your account settings. If you haven't installed Appcues yet, you might see something more like this picture below. When should they survey appear (frequency)? "After a user sees this survey, how many days later should they be able to see it again?" This frequency setting is defaulted to 60 days, with a minimum value of 15 days. This setting defines your survey's rolling cycle (once every X days). "How many pages should a user visit in a session before they see the survey?" To avoid interrupting your users' experience, we default to show this survey only after they have visited more than 5 pages of your site. You can change this setting to define a minimum number of page views before the survey triggers. Setting this value to 0 will allow the survey to show on first page view. 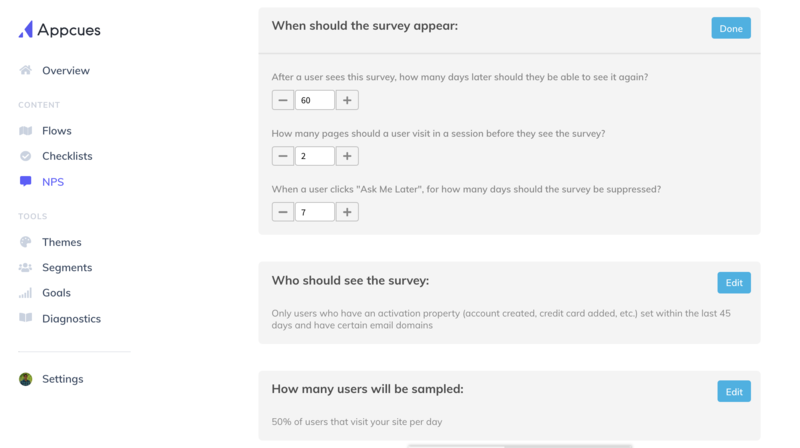 "When a user clicks 'Ask Me Later', for how many days should the survey be suppressed?" Your NPS survey will delay for 7 days if users click "Ask Me Later". You can change this value up to 1 day less than the survey's frequency. So, if your survey is on a 60 day cycle, then the max value of the "Ask Me Later" delay is 59. Before installation, you will not be able to change the settings in this section. After you've installed, you will be able to target only activated users. Activation is defined by the moment when a user experiences value in a product. This point varies from product to product. By targeting users who have activated, you can ensure that your NPS Survey will show only to a segment of users who have performed a certain action, and that action is a metric represented by a property on their user profile. Some example activation metrics are the user's account creation date or their subscription signup date. In the above example, we've used subscription start date as our activation date property. 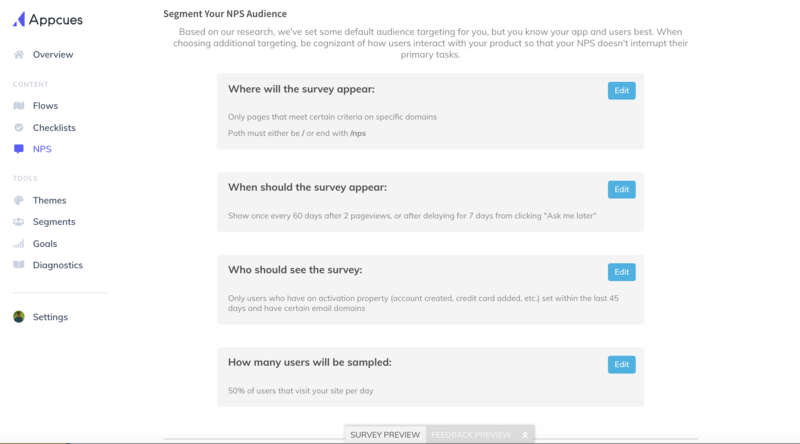 This will define a threshold of days before your NPS Survey will begin to show to your activated users. An example would be to show your NPS Survey to users who subscribed to a paid plan more than 45 days ago. You can also exclude a subset of users by their emails. Be sure to select the correct field that your product uses to access the email of your users. The user email field setting will also be used for your survey's dashboard, so that you can more easily identify your survey respondents by email. This setting allows you to spread your survey across the days within each cycle. This is particularly relevant for products with a large user base. By sampling a small portion of your user base each day, you can ensure a steady number of responses each day within each survey cycle.